Optical coherent technology is the key for Ciena today and it will remain so for the foreseeable future. However, the company is also focused on growing its services and software business in search of higher profits. These plans were discussed at Ciena’s technology event as the company’s vision for the future became more coherent. The optical networking business is tough. Huawei and ZTE emerged as formidable competitors to western suppliers over the last 10 years, forcing them to regroup. Lucent merged with Alcatel years ago and that merged company become part of Nokia in 2015. Ciena acquired Nortel’s optical networking operations in 2010, and the company has managed to maintain solid market positions in the U.S. and Europe while developing a significant amount of business in India, Australia, Japan and South Korea. Ciena’s leadership in innovation is essential to the company success. Ciena was early to the market with 100G, 200G and more recently 400G DWDM products and it helped the company to improve profitability in 2016-2017, as shown in the Figure below. 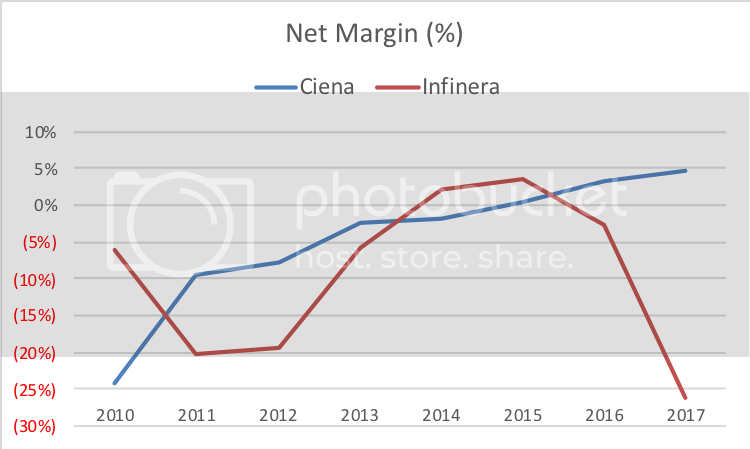 In contrast, Infinera’s profitability plunged in the last two years, as the company was late with 200G and 400G (per wavelength) products. Network automation is a new priority for service providers. It starts with simplifying service provisioning and network performance monitoring today, but it also holds a promise for intelligent autonomous networks in the future. Successes of artificial intelligence in beating humans in Chess and Go games illustrates the potential of this technology. However, the current state of intelligence used in networking is embryonic: it is still learning how to play Checkers, so forget Chess and Go for now. On a more serious note, Ciena’s focus on software dates back a few years. The company acquired Cyan in 2015 and has developed Blue Planet software solutions since then. These efforts have started to make a tangible contribution to the company’s revenues in the end of 2017 and the trend continued in the first months of this year. The company plans to make formal announcements of its new Blue Planet contracts soon and they are very impressive wins. In May 2018 Ciena acquired another software company – Packet Design - a privately held company, employing about 100 people with expertise in Layer 3 software and network automation. This acquisition extends Ciena’s capabilities to multi-layer (1, 2 and now 3) optimization. Specific new functions recently developed include traffic explorer, performance explorer, SDN traffic engineering and path provisioning. Ciena’s long term strategy is “to become the best in the world in automating networks”. It starts with solving real world problems for customers today, while letting the market “work through the hype” of SDN, NFV and AI. Ciena is investing into AI internally, leveraging open algorithms and teaching them new network scenarios. The company supports open source software initiatives, such as ONAP, despite all the challenges associated with it: “There is a lot of work to be done”. Who is going to do what remains to be seen. Service providers, led by AT&T, are taking a more aggressive approach to accelerate the progress of ONAP now. This will be among the topics discussed in the upcoming LightCounting report titled “How Cloud Services and Cloud Computing are Changing Service Provider Networks”.